The Paradise Tree: "The Book of Daniel"
Daniel O'Connor is the hero of my next novel. He was born in 1796 at Togher parish in Dunmanway, County Cork, Ireland, the son of Michael and Joanna Ronan O'Connor, one of nine children. Descended from the High Kings of Ireland and the Lords of Connaught, they were a branch of the O'Connor clan known as the Kerry-O'Connors. In the high middle ages they migrated from Roscommon to Kerry; some went on to Cork to aid the royal McCarthys, then the Lords of Munster, in their perpetual fight with the Normans. Cork was known as the "rebel county" and, at the time Daniel was born, was the site of many insurrections against the tyranny of English rule, which forbade the Irish Catholics the open practice of their religion. Due to the harsh penal laws imposed in 1695, Catholics could not own land, hold a public office, or receive an education. The O'Connors defied the laws to the best of their ability, and, according to Daniel's daughter Ellen, he and all of his siblings received a liberal education in spite of the prohibitions. The O'Connor family lived about a stone’s throw from an old tower called Togher castle. It had officially belonged to the McCarthy clan, but according to family tradition the O'Connors lived in the castle at one point. Perhaps they held the old keep in fealty to the original owners, or perhaps resided there as in-laws, since there was a great deal of intermarrying between the two clans. At any rate, they were all thrown out of the castle by the English in 1688 and reduced to a state of servitude. Daniel was trained as a blacksmith, and since it was the blacksmiths who set broken bones in those days, I wonder if it was his skill at mending injured limbs that led him to want to be a doctor. He studied medicine under a physician in Cork City, but alas he was never certified, probably due to lack of money. There was a series of potato crop failings and famines throughout the first half of the nineteenth century, culminating in the Great Famine of the 1840s. Many Irish Catholics found it impossible to ever get ahead. Daniel migrated to Canada in the spring of 1821. He worked and saved his money until he was able to purchase land in Leeds County, Ontario, which he called Long Point Farm. 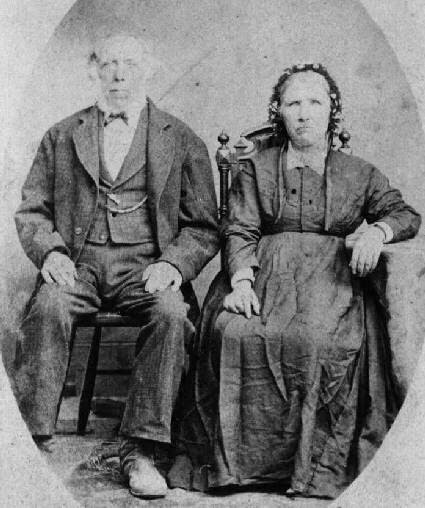 In January of 1831, he married fifteen-year-old Brigit Trainor of County Westmeath, who had recently arrived in Kitley Township with her family. Together they faced the grueling hardship of clearing the land, building a cabin, and having babies in the wilderness. There was also a great deal of prejudice against Catholics in the new world. According to Glenn J. Lockwood in Leeds and Lansdowne: "O'Connor was rare as an Irish Catholic settler in Leeds and Lansdowne Rear, and the reason why was no mystery. He found that local settlers were very prejudiced against anyone professing the Catholic religion, and more especially if that person happened to be an Irishman." (pp. 148-149, Lockwood) As one of Daniel’s daughters wrote to her niece Madeline O’Connor: “When father came to Delta one of the first salutes he got was 'for the love of God do not tell that you are a Catholic or you will not succeed.' He said, 'Never will I deny my faith,' and he fought valiantly for it." There were few priests, and Daniel often had to walk fifty miles or more in order to make his Easter duty, fending off wolves. As the children were born (they had eleven), he and Brigit sought to raise them in the Catholic faith. Education as well as faith was paramount to Daniel. He believed in education for women; all of his daughters were taught beside his sons. Donald Harman Akenson writes in his study, The Irish in Ontario: "In the rear of the township on Long Point, Daniel O'Connor, a large Catholic landholder who was recognized as the squire of the area, built a first-class stone school which became part of the common school network. " (Akenson, p. 276) Daniel eventually gained the respect of his neighbors and was appointed the first Irish Catholic magistrate in the County of Leeds. While serving as juryman in Brockville, the county seat, he was responsible for abolishing customs which were prejudicial to Catholics. Of the deceased it may be truly said that his faults were few and his virtues many. Upright and honest, a true-hearted Irishman, he leaves behind him memories which link his name to the true and trusted who have gone before. His death was more the result of the natural decay of old age more than actual sickness. And he died fortified by the sacraments of the church, in peace with himself, in peace with his fellowmen and in peace with his God. Elena Maria Vidal grew up in the countryside outside of Frederick, Maryland, "fair as the garden of the Lord" as the poet Whittier said of it. As a child she read so many books that her mother had to put restrictions on her hours of reading. During her teenage years, she spent a great deal of her free time writing stories and short novels. Elena graduated in 1984 from Hood College in Frederick with a BA in Psychology, and in 1985 from the State University of New York at Albany with an MA in Modern European History. In 1986, she joined the Secular Order of Our Lady of Mt. Carmel. Elena taught at the Frederick Visitation Academy and worked as a private tutor as well as teaching children's etiquette classes. During a trip to Austria in 1995, she visited the tomb of Empress Maria Theresa in the Capuchin crypt in Vienna. Afterward, she decided to finish a novel about Marie-Antoinette she had started writing ten years before but had put aside. In 1997 her first historical novel, TRIANON, was published by St. Michaels Press. In 2000, the sequel, MADAME ROYALE, was published, as well as the second edition of TRIANON, by The Neumann Press. Both books quickly found an international following, which continues to this day. In 2010, the third edition of TRIANON and the second edition of MADAME ROYALE were released. In November 2009, THE NIGHT'S DARK SHADE: A NOVEL OF THE CATHARS was published by Mayapple Books. The new historical novel deals with the controversial Albigensian Crusade in thirteenth century France. Elena has been a contributor to Canticle Magazine, Touchstone Magazine, The National Observer, and The American Conservative. In April 2009, she was a speaker at the Eucharistic Convention in Auckland, New Zealand. In August 2010, Elena spoke at The Catholic Writers Conference in Valley Forge, PA. She is a member of the Catholic Writers Guild and the Eastern Shore Writers Association. She currently lives in Maryland with her family. For more information, please visit Elena's website and blog. You can also connect with her on Facebook, Twitter, and Goodreads.